Oppo device with SD710 shows up on Geekbench, is it the R17 Pro? 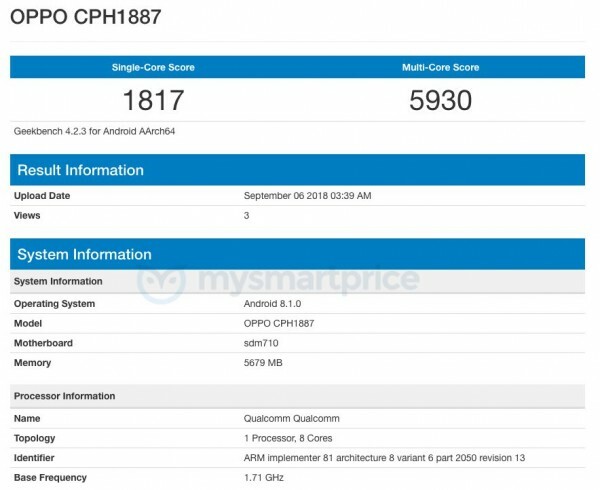 An as of yet unidentified Oppo device with the codename CPH1887 has been spotted on the Geekbench benchmark with a Snapdragon 710 chipset and 6GB of RAM. This is the first time we come across the model number but given its specs we'd wager a guess it's the Oppo R17 Pro (or some variation of it under a different name), as that's the only current Oppo smartphone with the Snapdragon 710 chipset. The benchmark also reveals that the Oppo device is running Android 8.1, likely under ColorOS 5.2. The benchmark listing has since been removed, but if you do a quick search for Oppo in Geekbench you'll come across many devices codenamed CPHxxxx. Interestingly, none of them use the Snapdragon 710. We'll keep you posted if the CPH1887 pops up again. Is there any device with snapdragon 710 which has launched officially? Nobody cares on "bottle gourd" F9 by the way.